(Nanowerk News) IBM Research today announced a major engineering breakthrough that could accelerate carbon nanotubes replacing silicon transistors to power future computing technologies. IBM scientists demonstrated a new way to shrink transistor contacts without reducing performance of carbon nanotube devices, opening a pathway to dramatically faster, smaller and more powerful computer chips beyond the capabilities of traditional semiconductors. The results will be reported in the October 2 issue of Science ("End-bonded contacts for carbon nanotube transistors with low, size-independent resistance"). Schematics showing the conversion from a side-bonded contact (left), where the SWNT is partially covered by Mo, to end-bonded contact (right), where the SWNT is attached to the bulk Mo electrode through carbide bonds while the carbon atoms from originally covered portion of the SWNT uniformly diffuse out into the Mo electrode. Silicon transistors, tiny switches that carry information on a chip, have been made smaller year after year, but they are approaching a point of physical limitation. With Moore's Law running out of steam, shrinking the size of the transistor – including the channels and contacts – without compromising performance has been a vexing challenge that have troubled researchers for decades. IBM has previously shown that carbon nanotube transistors can operate as excellent switches at channel dimensions of less than ten nanometers – the equivalent to 10,000 times thinner than a strand of human hair and less than half the size of today’s leading silicon technology. IBM's breakthrough in creating a new contact approach overcomes the other major hurdle in incorporating carbon nanotubes into semiconductor devices, which could result in smaller chips with greater performance and lower power consumption. Earlier this summer, IBM unveiled the first 7 nanometer node silicon test chip, pushing the limits of silicon technologies and ensuring further innovations for IBM Systems and the IT industry. By advancing research of carbon nanotubes to replace traditional silicon, IBM is paving the way for a post-silicon future and delivering on its $3 billion chip R&D investment announced in July 2014. 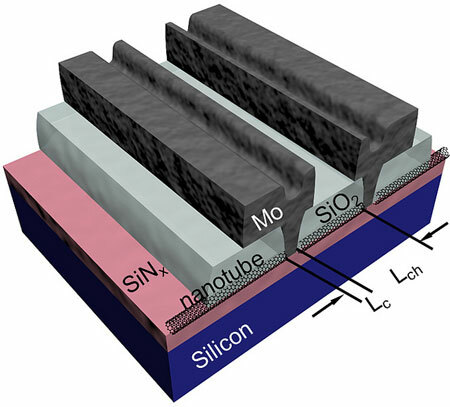 Schematic of a set of Mo end-contacted nanotube transistors made on the same nanotube with Lc ranging from ∼10 to 60 nm defined by SiO2 contact trenches.